PLEASE NOTE! Our motor manufacturer has changed the motor slightly so that now the drums cannot be hand turned when the motor is in the OFF position as the old style motors could be. To hand turn the drum for removing roving, rolags, and batts leave the motor ON, turn it to the slowest setting so the drum does not move on it's own, and flip the direction switch in the direction you wish to hand turn the drum. 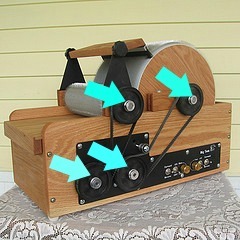 For example: If you are rolling rolags off your drum carder your drum needs to be set to the Backward position. **pdf file contains previous contact info. Please use Contact form if you have questions. don't forget to check the tightness of your pulley wheels occasionally on all motorized tools!